Authorised biography promises "an honest and detailed read"
An authorised Graham Bonnet biography will be released early next year. Graham Bonnet: The Story Behind The Shades is written by Steve Wright and is expected in early 2016. 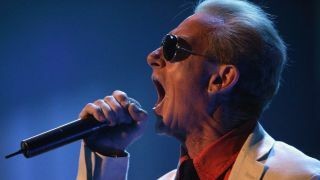 It charts the former Rainbow, Alcatrazz and MSG frontman’s career from his early days with The Marbles through to his current project, the Graham Bonnet Band. As well as a standard print of the book, a limited-edition version signed by Bonnet and bundled with a CD of rare material and a unique cover design is being worked on. The Graham Bonnet band will release an album of original tracks next year and head out on a UK tour. Shows in Australia and New Zealand have also been confirmed.